HOLIDAY CLINICS!!!!!! 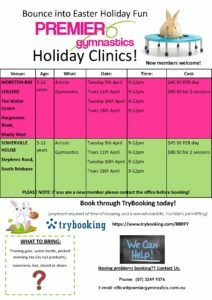 These April School Holidays at Manly West and South Brisbane. Open to current and new members. Please use the Try Booking link below to book your tickets. Tickets are set up for 1/2 days at each venue and according to which day you wish to attend. Haven’t been with Premier before?…No worries – please just contact the office before you book your ticket: 3249 9376. We look forward to seeing you there! Click on the image to find out more and to access the link to the Try Booking Page!